In 1892 the independent status of the Hazara was finally ended, for, after various revolts, they were crushed by the forces of Amir Abdur Rahman Khan which advanced on Hazarajat from all sides. All the Hazara leaders were captured and taken to Kabul, and “all anxiety and fear of rebellion is at an end, and the man is not to be found who could incite the people to rebellion, for he does not exist.” (Abdur Rahman Khan 1900, Vol. 1, p. 283). Abdur Rahman Khan devotes a whole chapter in his memoirs to this war, writing that: “…. 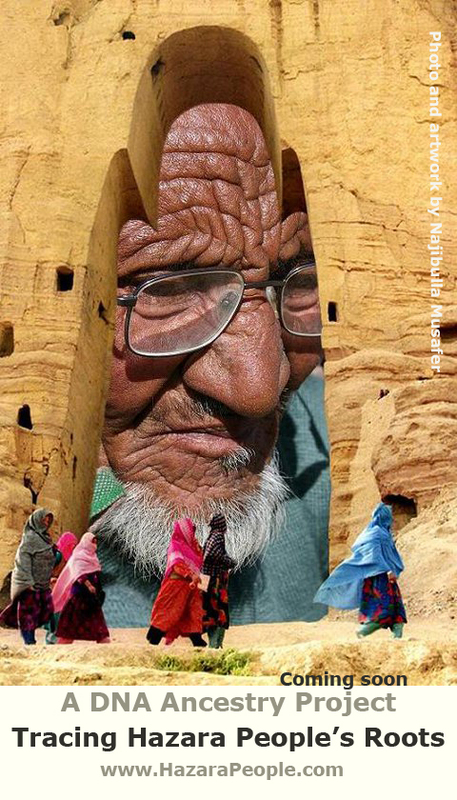 Afghan chiefs had applied several times to raise a force of country people at their own expense to fight against the Hazaras, whom they looked upon as enemies to their country and religion. I had not given them permission to do this heretofore, but not [spring 1892]I gave a general order that everybody would be allowed to go and help in the punishment of the rebels.” He continues: “Before the arrival of these volunteers the Hazaras were defeated from three directions …. Near Uruzgan.”(I.c, p.283). Fig. 1.—Approximate extent of the Pashtun nomads’ summer and winter areas. 1. And 2. Approximate upper limit of the nomads’ winter areas. 3. Grazing areas of the Durrani and “Durrani-ised” Ghilzai. 4. 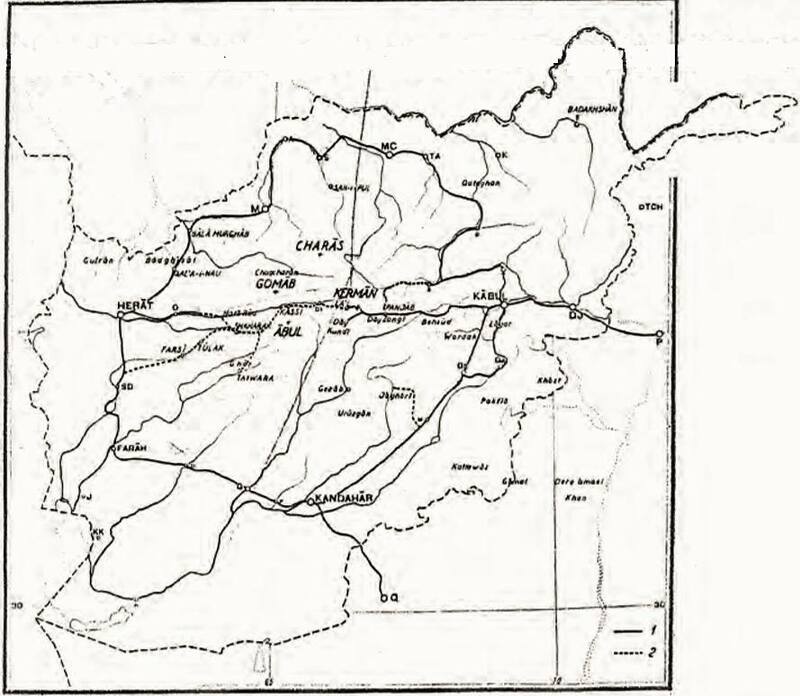 Grazing areas of the Ghilzai and other East Afghan tribes. 5. Direction of spring migrations. Information concerning North Afghanistan is largely omitted owing to its inadequacy. 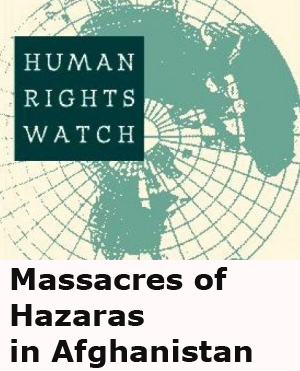 “In the time of Sher Ali Khan (1863-80) these Hazara people were controlled by their own mirs, and they taxed the people, and took also some salaries from the government. When Abdur Rahman Khan came from Bohkara (1880) and beat Sher Ali Khan and took the Kabul Kingdom, the Hazara mirs were for Sher Ali, and they therefore made a big rebellion against Abdur Rahman Khan [there were continuously more or less serous rebellions from 1888-92].” At that time Abdur Rahman Khan spoke with the Mohmand and the Ahmadzai tribes and asked them to fight the Hazaras: “Heads will be mine, and all property will be yours”! Then big fights started between the Hazaras and the Pashtuns, and at last the Pashtuns were victorious and captured Behsud, Day Zangi, Day Kundi and Shahristan etc., and all the Hazaras from these areas were either killed, or forced to leave. 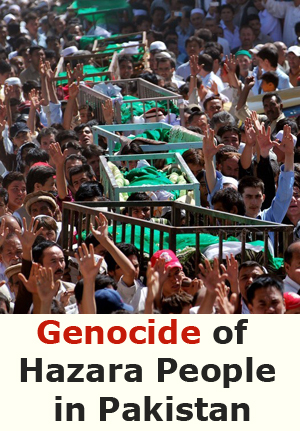 –The (Hazaras) made up bands and concentrated in some places like Chahar Sad Khana (in the farthermost Day Kundi), in Uruzgan, Jaghori, Malestan, and some went to Bamian, and to Turkistan and settled there. The Ahmadzai Khan went on: “In the time of Abdur Rahman Khan, Qazi Yaqub Ali was responsible for the division of the grazing lands between the kuchis (i.c. the nomads), and he called on all the maliks (i.c. the men in charge on the different levels in the tribal system) of all the kuchis, and most important among these were the Mohmand and the Ahmadzai, and they got as much land as they wanted, grazing lands as well as farmlands, ….. ”. Let us break the narrative here. What actually happened was, that the country of the Hazaras was divided up among different Afghan, Pashtun tribes, as a reward for their help, and to secure the final appeasement of these regions. 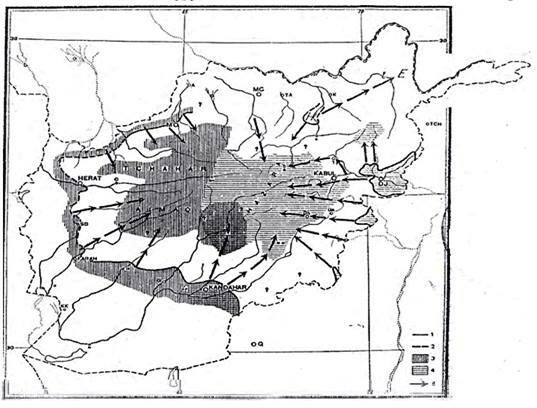 In the southern, warmer and more habitable districts Afghans were settled (Dahla, Tiri(n), Uruzgan, Daya wa Folad and Gezab), whereas the more central parts, the most elevated, were divided among the Pashtun nomads. 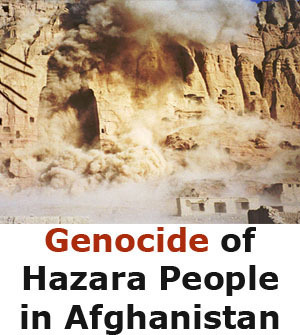 Form the Khan’s account it appears that all the Hazara left the area and that the nomads were given the whole territory. However, they were unable to cultivate it, for they possessed no knowledge of this, and they could not imagine spending the winter in the villages there, which lay at altitudes of 2800-3200 meters. The result was as the chief says: “In the time of Amir Habibullah Khan (1901-1919) the Ahmadzai made a big mistake, telling the government, that they were not able to cultivate the land, and therefore the government brought back the Hazara to their previous land. 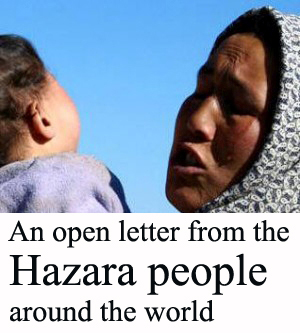 As time went by the Hazara became somewhat stronger, and clashes occurred between the Hazara and the Pashtun.” …. Fig. 2.—Map of towns (villages), areas and nomad bazars. For abbreviations see text, fig. 1. 1.Circum-Afghan road network and the two main roads to Pakistan, plus the more used stretches of the central Afghan highways. 2. Central Afghan highways that are still poorly used or not used at all for regular Lorry traffic. N.B. there are several more roads than shown, but they are not used by Lorries. One road from Uruzgan has been continued on to Gezab, and it is intended to link it up with a road from Panjab running south. The case was that, apart from the general animosity which governed the feelings of the two populations, there was now in fact competition in the exploitation of certain areas: the Hazara could operate dry-farming (lalmi) on the not too-sloping mountain sides, and the nomads were able to utilize the same tracts as pasturage. Under King Ammanullah Khan (1919-1929), a new distribution, undertaken, according to the Ahmadzai khan, on conditions unfavorable to the nomads (the Ahmazai had just revolted against the government) was made of the nomads’ and the Hazaras’ respective areas. The old fermans (i.e. royal order or decree, actually legal confirmation were withdrawn from the Ahmadzai and the Mohmands, and new ones were issued far more vaguely formulated, as the nomads were merely allotted the high-lying stretches above the valleys where there were permanent watercourses that could be used for agriculture. According to the nomads it was these fermans that, generally speaking, were still in force. However, quite vague in formulation they could not have been, as cache single sub-tribe, section or group possesses papers, ferman, for tis respective areas. 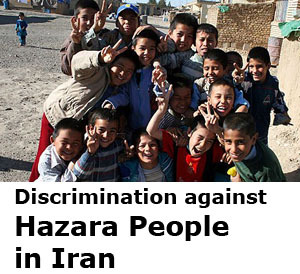 Within these, on a more traditional basis, a further division into family territories has been undertaken, so that each year the nomads return to quite definite camping grounds in Hazarajat. Local trade (and other economic relations) between nomads and Hazaras within a narrower geographical area as a result of their more or less “permanent” proximity during the summer time. The temporary nomad bazars that are now all to be found in the areas of the Aimaq. This is the end of part one, and we are going to publish part 2 in December 14, 2014. Ferdinand, Klaus. 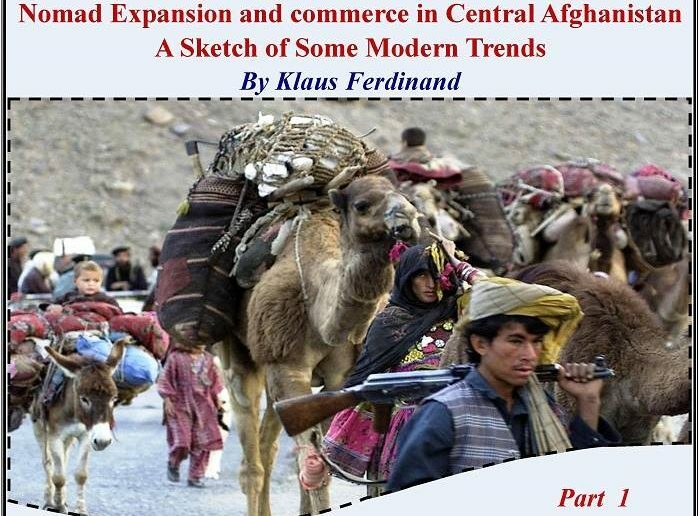 Nomad Expansion and Commerce in Central Afghanistan: A Sketch of Some Modern Trends. København: Dansk Etnografisk Forening, 1962. p. 126-130. Print.